MySecretFolder™ is a software utility that you can use to hide your private folder from other users, hide it so that no one will even suspect that your secret folder exists! Yet the folder would be easily accessible to you, when you need it: just run the MySecretFolder application (or double-click the notification taskbar icon), enter your password, and it will unlock and open the folder. While the folder is unprotected, you can work with the files and documents it contains, just like with any other folder you have. 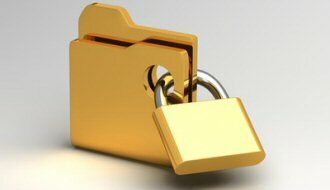 When you are done, lock the folder and the folder will disappear again, until you need it next time. 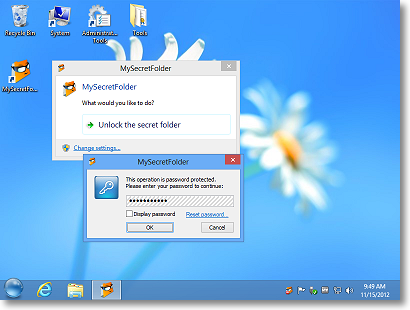 You can use MySecretFolder software to hide a folder from Windows Explorer and other programs. In addition to hiding it, MySecretFolder also locks your secret folder with a password. 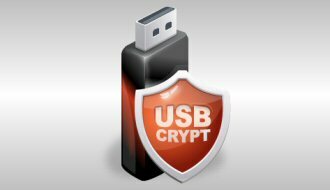 Other users of your computer would not be able to open the folder or the files it contains unless they know the password you have set up. You can configure MySecretFolder to display a taskbar icon for quick access to your secret folder, as well as as to serve as an indicator of the status of its protection. You can set up MySecretFolder to clean up the system list of the most recently used programs and documents from the traces of the files located in your secret folder, so that other users would not be able to detect the presence of your secret folder. No problem: If you forget your password, or if some other problem occurs, simply click on the Reset password link on the password window, and enter your valid license information into the form. If the license information that you have entered matches the license of your copy of MySecretFolder, it will unprotect your personal folder for you. Try it for 30 days with no obligation to continue, no strings attached, no "nag messages" displayed to other users, and see for yourself how MySecretFolder can be of use to you. If you don't like it, simply use the Add/Remove Programs command of Windows Control Panel to remove it from your computer, that's it.